There's nothing more I love than taking a nice, hot bath and relaxing at the end of a long day. I love bath time so much- it's seriously the best time. But bath time means using up my store of Lush products and although I would like it to be, it is not an endless stash. My favourite bath bombs do come at a price, sometimes which I can't necessarily afford on my student budget. I thought I would share this bath bomb DIY, but if Bath Bombs aren't your thing then you can check out my Bath Salts DIY here. 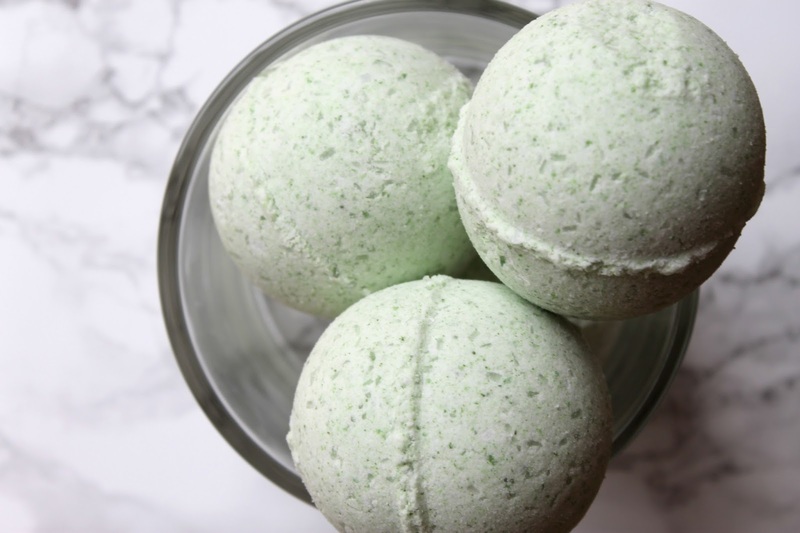 I chose to colour my bath bombs this gorgeous lime green and scent it with a relaxing blend of essential oils which will help me off to the land of nod next time I take a bath. 1. Add the dry ingredients together into one bowl and whisk them through to disperse the ingredients. 2. Put the wet ingredients in a separate cup and stir to mix. If you are using a 'solid' oil (eg. coconut oil) make sure you melt it first before adding in your water and food colouring. 3. Add in the wet mixture to the dry ingredients, pouring bit by bit and mixing through in between intervals. Be careful not to add too much of the wet mixture at once as it will activate the Citric Acid and render your bath bomb 'un-fizzy'. 4. Once everything has been mixed through and your happy with the colour of your bath bomb, you can start scooping it into the little moulds. 5. The moulds will be a bit temperamental and prone to breaking at first, so make sure you tape up each side to secure it in place while it dries. Leave them to set for 24hrs. 6. You can pop them out of the moulds after that and they will be ready to use. Just pop one in the bath and go! I can confirm that the food colouring in these bath bombs will not stain your bathtub or skin as tested and proved by me (and my bathtub), so you can make these bath bombs until your heart is content! I think this is a great little DIY perfect for both the young and the young at heart. What are some of your favourite DIY projects? Are there any special requests/ projects you would like to see on the blog? These look good enough to eat! Really, they look like delicious scoops of ice cream! They also look like they're super easy to make. I may have to try this one out! Haha thank you Amy! I definitely will be trying out different combinations of colours and scents soon. Let me know if you decide to give these a try! No worries, let me know if you do try them out! Where do you get citric acid? That's the only ingredient that I don't have and actually never use or see in store either. I'm really looking forward to trying this DIY, it would make such a cute gift too! I've never used it before either Shireen, I found mine in my local supermarket next to all the baking supplies! It would be such a cute gift, especially since Christmas is approaching too! Wowww that's such an interesting diy! at the first place i though those are lush bath bombs! Just awesome, i love the idea! Thanks so much lovely, I hope you try them ! You are amazing and creative! Aww thanks so much Zarrah! Thanks Miriam! I hope you try them out sometime!